This is an ongoing project of experimental tall thin pieces representing the lost townships of my parish. They are intended to hang as a group and are two sided so they can be walked among like a forest of places. The projects is inspired by my research into the early 19th century clearances of my home parish of Strath Brora. I used Sutherland Estates papers and maps to find where the cleared villages once were and who lived in them then. I also walked to the places to see for myself the houses and mills, sheepfolds and peat banks, to speculate about crops and trackways. SMEORAIL is a side valley, rising from the lochside through pines and birchwoods and out onto the pasture and moor above, where several settlements once were. This tapestry describes the walk up the strath through the woods, past the ruined townships and beyond to the high moor where giant wind turbines will soon be. 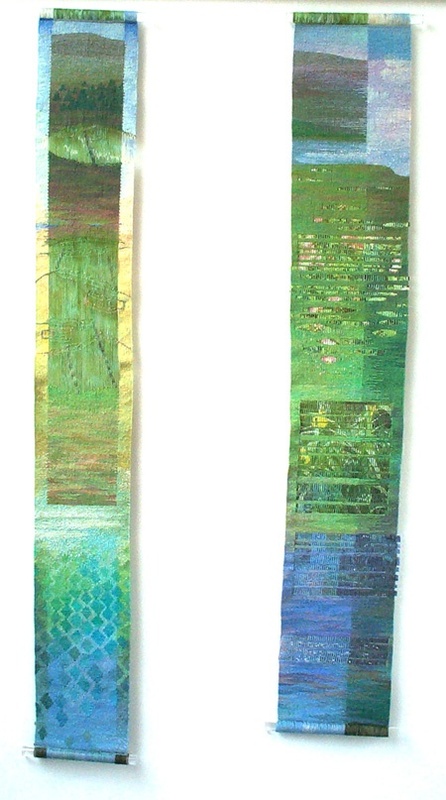 All these tapestries are woven on tie-dyed wool warps so that when the warps are exposed, either by the insertion of digital image strips or by leaving gaps in the fabric of the weave, they blend in or actively contribute to the composition.